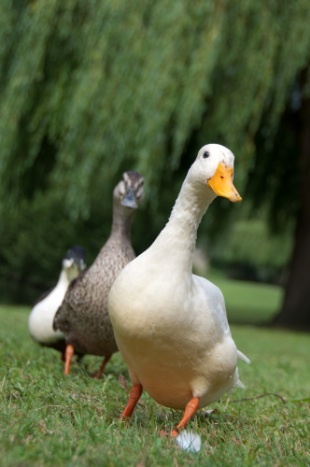 Duck is another type of domesticated bird bred for consumption. Duck is often more expensive that chicken. It is unsuited to intensive farming and tends to have a low ratio of meat on it compared to its size. It also has a lot of fat. Because of this fat content, whole ducks are best roasted. The main breeds that reach our table these days are Aylesbury, Barbary and Gressingham. What to look for when buying duck? Chose a duck with dry, pale, mark free skin, that has a long plump breast. Make sure there are no marks or blemishes on the legs and feet. To find out more about duck visit our 'how to roast a duck' page.